Could Minilateralism Be Multilateralism’s Best Hope in the Asia Pacific? Minilateral initiatives have the potential ability to be more effective than their multilateral cousins. Multilateralism has taken a beating in recent times. With events such as the Trump administration’s withdrawal of the United States from various multilateral agreements, as well as Brexit, a key pillar of the post-World War II international liberal order appears to be weakening. In the Asia Pacific, regional multilateralism — and in particular those groupings centred on the Association of Southeast Asian Nations (ASEAN) — is likewise coming under pressure for its perceived inability to address regional problems. Alongside the apparent decline of multilateralism has been the rise of minilateral platforms in the Asia Pacific, such as the Quadrilateral Security Dialogue (Quad) 2.0, Lancang-Mekong Cooperation (LMC) mechanism, Sulu Sea trilateral patrols, and “Our Eyes” Initiative, an intelligence sharing network comprising six ASEAN member states. These minilateral initiatives, with their narrower and exclusive membership, have the potential ability to be more effective than their multilateral cousins. To be sure, minilateralism is not an unfamiliar phenomenon in the region. What is different this time, however, is the increasing possibility that the latest minilateral initiatives may pose a serious challenge to the extant multilateral architecture in the region. This is due to a confluence of factors, including China’s growing power and influence, the ensuing Sino-U.S. rivalry for regional leadership, the dismissal of multilateralism by some states, as well as the apparent weakening of ASEAN unity. Given this context, minilateralism could overshadow and eventually challenge multilateralism. Unlike multilateralism, which typically emphasises inclusivity, and nondiscrimination, minilateralism is often exclusive, with participation restricted only to those states that are directly involved in the matter. In this sense, minilateralism could prove more effective than multilateralism in responding to specific issues and move regional cooperation beyond the proverbial low-hanging fruits. The decision-making process would also possibly move faster among like-minded networks, without a need defer to multilateral consensus building that has often resulted in lowest-common-denominator outcomes. These may enhance the importance of minilateralism to states, but possibly at the expense of their commitment to multilateralism. A second way that minilateralism could challenge multilateralism would be if minilateral initiatives become platforms for major power rivalry. Certainly, this is true also of multilateral platforms; there is, however, a slight but essential distinction. Multilateralism platforms, such as the ASEAN-centric ones, involve both China and the United States. The two major powers may compete for regional leadership, but they both are members of the same platforms and each could balance the other’s influence within those platforms. On the other hand, the exclusive nature of minilateralism means that an initiative could be centered only on one major power that would have relatively free rein to assert its influence over the smaller participating countries. For instance, with the United States and China being perceived as the dominant players of the Quad 2.0 and LMC mechanism, respectively, it is not too farfetched to argue that each major power could create its own sphere of influence in the Asia-Pacific and potentially side-line broad ASEAN-centric multilateralism. Yet, there is also a chance that minilateralism could be multilateralism’s best hope in the current climate. This perspective assumes that minilateral initiatives are the building blocks of multilateralism, and that it could supplement the inadequacies of existing multilateralism without delegitimizing it. For instance, if minilateralism’s strengths lie in its ability to achieve concrete results in a more time-efficient manner, then it could act as a useful operationalization of multilateral-level dialogue. 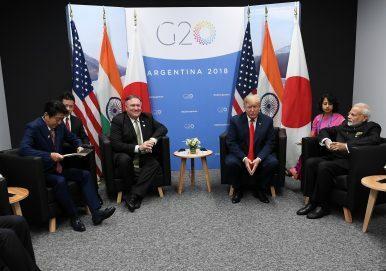 Moreover, for governments grappling with justifying the commitment of resources to multilateralism that do not seem to result in concrete outcomes — as evident in several countries currently — participating in minilateral initiatives that are focused on specific targets could help to deflect some of the criticism. There should be a clear sense of the distinctive strengths of regional minilateralism and multilateralism. For example, multilateral dialogue places the smaller states alongside bigger powers at the same table, allowing the former to at least have some kind of voice in negotiations. Multilateralism, to some extent, accords legitimacy to decision making processes. On the other hand, minilateralism helps like-minded countries secure tangible results. Hence, the differences between minilateralism and multilateralism are not only in terms of the number of participants, but also in relation to their respective processes and aims. These are different — but not necessarily mutually exclusive — aspects of interstate cooperation. Minilateralism and multilateralism could go hand-in-hand. The important thing would be to ensure that minilateralism is seen as part of and complementary with a broader multilateral process, not something that replaces it. In this way, minilateralism could help to fortify multilateralism in the Asia Pacific. Sarah Teo is Associate Research Fellow with the S. Rajaratnam School of International Studies (RSIS), Nanyang Technological University, Singapore, and a PhD candidate at the Department of Government and International Relations, University of Sydney, Australia. Singapore’s experience might offer useful lessons for fellow ASEAN members as the region transforms into a digital economy. Reckoning With Human Rights Violations in Thailand's Extraterritorial InvestmentsMalaysia Won't Look Away From China So Soon, Despite Mahathir's WordsRohingya Crisis Demands Australian Leadership on Human RightsWhy Did Duterte Chicken out of the ASEAN-Australia Summit?Is Promoting Human Rights in ASEAN an Impossible Task?